The Doctor Who villain may be heading for the television scrapyard, but a £200 sit-in version has been named this year's top festive toy. For all you parents out there, the future is easy to predict. Later this year, on the morning of December 25 to be exact, the first words you'll hear will be: "Exterminate! Exterminate!". The Daleks may be heading for the television scrapyard, but a £200 sit-in inflatable version of the Doctor Who villain has been named as the top toy for Christmas 2011. That's the verdict of experts at Glasgow's Hamleys store, who have released their wishlist predictions. And this year's batch are heavy on must-have movie merchandise. The Fully Loaded McMissile features the voice of Michael Caine uttering phrases such as "This is top secret!" and "We're being followed!" 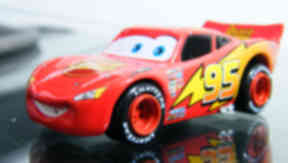 from the Pixar film, Cars 2. And the movie series Transformers has produced 3 Mech Tech Leader Asst, a robot hero figure that converts from a vehicle to a robot. A Justin Bieber doll with real hair will surely conquer the teenage girl market, while robotic chick My Keepon, which dances and responds to touch, has quirky appeal. Laura Olver, head of buying at Hamleys, said: "There's a lot that's movie driven this year, with Cars 2, Transformers 3, and the success of Disney Princess." So as you wait for the summer to arrive, why not take the opportunity to bag an inflatable Dalek so Christmas doesn't blow up in your face.